A million more European Union (EU) migrants could come to the UK and settle permanently if free movement is extended into the so-called Brexit ‘transition period’, a report has claimed. Michel Barnier, the EU’s chief negotiator, has reportedly drawn up guidelines demanding mass migration continues after Brexit, contradicting an agreement struck with the UK in December. The UK had initially wanted the cut-off date to be the day of the Brexit vote. 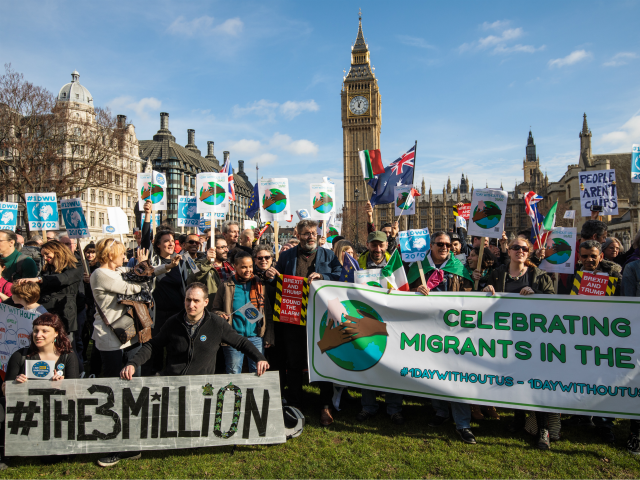 A paper from Migration Watch UK, published Thursday, claimed that if the prime minister caves to the demands, those arriving after March 2019 would be able to stay for the five years necessary to qualify for permanent settlement, and could bring over family members. Based on the annual average of 535,000 migrant arrivals from the EU registering for national insurance numbers between 2012-13 and 2016-17, the think tank calculated a million people could come in during the ‘transition period’. “The government should stand firm on its position that the ‘specified date’ in the provisional agreement on citizens’ rights should be the formal date of Brexit – the end of March 2019,” the authors urge. They continue: “If it agrees that those arriving from the EU up until the end of the transition period should be able to begin accruing time towards settled status then up to a million more EU nationals could gain the opportunity to do so provided that they register with authorities following arrival. “The bulk of those arriving would likely be Eastern Europeans who, historically, have put a relatively greater burden on the UK Exchequer. During a three year transition period, the total number of arrivals could reach up to 1.5 million.